On December 2, 1982, the fully mechanical Jarvik-7 heart was placed inside Barney Clark, culminating years of painstaking research and making medical history by successfully pumping Clark’s blood for 112 days. 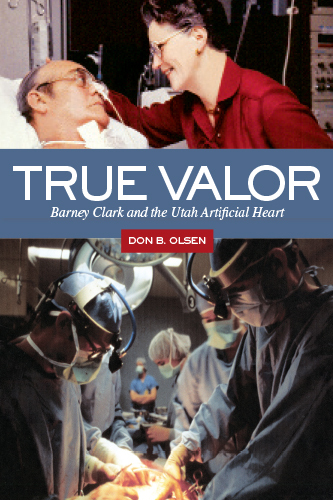 True Valor takes an in-depth look at this significant event by telling the story of the doctors and researchers involved, of Barney Clark, and of the evolution of the artificial heart before and after Clark’s transplant. Author Don Olsen is well positioned to tell this story, having worked on the artificial heart project under Dr. Willem Kolff, the man behind the Jarvik-7. His narrative conveys the concerns and emotions of those who were part of Clark’s story while offering the insights of one who knows that research does not happen overnight but takes time, resources, and the efforts of many people. Olsen’s account shares the human sides of this story along with the embedded politics and technical details of medical research in clear, readable language. Donald B. Olsen is professor emeritus of bioengineering at the University of Utah. As a veterinarian and researcher, he worked on the development of the artificial heart, testing its functionality in calves. Today he is the president of the Utah Artificial Heart Institute.